Below are the supported options. --table-name <table_name> - By default JHipster will generate a table name based on your entity name, if you would like to have a different table name you can do so by passing this option. --angular-suffix <suffix> - If you want all your Angular routes to have a custom suffix you can pass that using this option. --client-root-folder <folder-name> - Use a root folder name for entities on the client side. By default it’s empty for monoliths and the name of the microservice for gateways. --regenerate - This will regenerate an existing entity without asking any questions. --skip-server - This will skip the server-side code and will generate only the client-side code. --skip-client - This will skip the client-side code and will generate only the server-side code. --db - Specify the database when skipping server side generation, has no effect otherwise. Warning: Don't choose a short name for your entity (see this ticket). This page describes how to create entities with JHipster using the standard command-line interface. If you want to create many entities, you might prefer to use a graphical tool. JHipster UML, which allows you to use an UML editor. JDL Studio, our online tool to create entities and relationships using our domain-specific language JDL. You can generate entities from a JDL file using the import-jdl sub-generator, by running jhipster import-jdl your-jdl-file.jh. If you do not want to regenerate your entities, while importing a JDL, you can use the --json-only flag to skip entity creation part and create only the json files in .jhipster folder. If you want to use JHipster UML instead of the import-jdl sub-generator, you need to install it by running npm install -g jhipster-uml, and then run jhipster-uml yourFileName.jh. For each entity, you can add as many fields as you want. You will need to input the field names and their types, and JHipster will generate for you all the required code and configuration, from the Angular HTML view to the Liquibase changelog. JHipster supports many field types. This support depends on your database backend, so we use Java types to describe them: a Java String will be stored differently in Oracle or Cassandra, and it is one of JHipster’s strengths to generate the correct database access code for you. String: A Java String. Its default size depends on the underlying backend (if you use JPA, it’s 255 by default), but you can change it using the validation rules (putting a max size of 1024, for example). BigDecimal: A java.math.BigDecimal object, used when you want exact mathematic calculations (often used for financial operations). LocalDate: A java.time.LocalDate object, used to correctly manage dates in Java. Instant: A java.time.Instant object, used to represent a timestamp, an instantaneous point on the time-line. ZonedDateTime: A java.time.ZonedDateTime object, used to represent a local date-time in a given timezone (typically a calendar appointment). Note that time zones are neither supported by the REST nor by the persistence layers so you should most probably use Instant instead. Enumeration: A Java Enumeration object. When this type is selected, the sub-generator will ask you what values you want in your enumeration, and it will create a specific enum class to store them. Blob: A Blob object, used to store some binary data. When this type is selected, the sub-generator will ask you if you want to store generic binary data, an image object, or a CLOB (long text). Images will be handled specifically on the Angular side, so they can be displayed to the end-user. Validation can be set up for each field. Depending on the field type, different validation options will be available. JHipster generates unit tests that work for generic entities, without knowing your validation rules: it is possible that the generated tests do not pass the validation rules. In that case, you will need to update the sample values used in your unit tests, so that they pass the validation rules. Entity relationships are only available for SQL databases. It is a fairly complex subject, which has its own documentation page: Managing relationships. Having a separate service class allows to have more complex logic that just using a Spring REST Controller directly. Having a service layer (with or without an interface) will allow you to use DTOs (see next section). This is the same logic as using the Spring service sub-generator, so we recommend to read its documentation to have more information. By default JHipster entities do not use DTOs, but they are available as an option, if you choose to have a service layer (see previous section). Here is the documentation: Using DTOs. Optionally, entities stored in SQL databases can be filtered using JPA. Here is the documentation: Filtering your entities. Please note that pagination is not available if you created your application with Cassandra. Of course this will be added in a future release. Pagination uses the Link header, as in the GitHub API. JHipster provides a custom implementation of this specification on both the server (Spring MVC REST) and client (Angular/React) sides. The entity configuration is saved in a specific .json file, in the .jhipster directory. So if you run the sub-generator again, using an existing entity name, you can update or regenerate the entity. TIP: to regenerate all your entities at once, you can use the following commands (remove the --force to have questions asked when files have changed). This is a short tutorial on creating two entities (a Author and a Book) which have a one-to-many relationship. As we want to have a one-to-many relationship between Authors and Books (one author can write many books), we need to create the Author first. 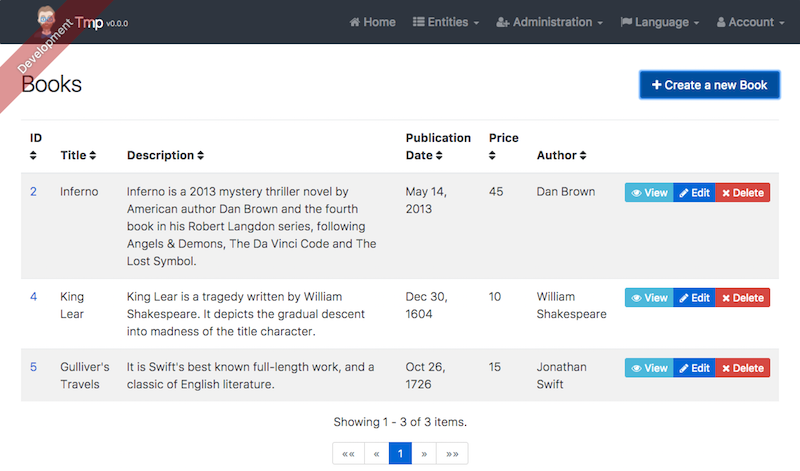 At the database level, JHipster will then be able to add a foreign key on the Book table, linking to the Author table. Run the generated test suite, with mvn test, which will test the Author entity and the Book entity. Launch the application (for example with mvn), log in and select the “Author” and “Book” entities in the “entities” menu. Check the database tables, to see if your data is correctly inserted. The generated files contain all the basic CRUD operations, and don’t need to be modified if your needs are simple. If you want some more complex business behaviors, you might need to add a Spring @Service class, using the service sub-generator.